Samples of surface water and suspended sediment were collected from the two branches that make up the Elizabeth River in New Jersey—the West Branch and the Main Stem—from October to November 2008 to determine the concentrations of selected chlorinated organic and inorganic constituents. The sampling and analyses were conducted as part of Phase II of the New York–New Jersey Harbor Estuary Plan–Contaminant Assessment and Reduction Program (CARP), which is overseen by the New Jersey Department of Environmental Protection. Phase II of the New Jersey Workplan was conducted by the U.S. Geological Survey to define upstream tributary and point sources of contaminants in those rivers sampled during Phase I work, with special emphasis on the Passaic and Elizabeth Rivers. This portion of the Phase II study was conducted on the two branches of the Elizabeth River, which were previously sampled during July and August of 2003 at low-flow conditions. Samples were collected during 2008 from the West Branch and Main Stem of the Elizabeth River just upstream from their confluence at Hillside, N.J. Both tributaries were sampled once during low-flow discharge conditions and once during high-flow discharge conditions using the protocols and analytical methods that were used in the initial part of Phase II of the Workplan. Grab samples of streamwater also were collected at each site and were analyzed for cadmium, suspended sediment, and particulate organic carbon. The measured concentrations, along with available historical suspended-sediment and stream-discharge data were used to estimate average annual loads of suspended sediment and organic compounds in the two branches of the Elizabeth River. Total suspended-sediment loads for 1975 to 2000 were estimated using rating curves developed from historical U.S. Geological Survey suspended-sediment and discharge data, where available. Concentrations of suspended-sediment-bound polychlorinated biphenyls (PCBs) in the Main Stem and the West Branch of the Elizabeth River during low-flow conditions were 534 ng/g (nanograms per gram) and 1,120 ng/g, respectively, representing loads of 27 g/yr (grams per year) and 416 g/yr, respectively. These loads were estimated using contaminant concentrations during low flow, and the assumed 25-year average discharge, and 25-year average suspended-sediment concentration. Concentrations of suspended-sediment-bound PCBs in the Main Stem and the West Branch of the Elizabeth River during high-flow conditions were 3,530 ng/g and 623 ng/g, respectively, representing loads of 176 g/yr and 231 g/yr, respectively. These loads were estimated using contaminant concentrations during high-flow conditions, the assumed 25-year average discharge, and 25-year average suspended-sediment concentration. Concentrations of suspended-sediment-bound polychlorinated dibenzo-p-dioxins and polychlorinated dibenzo-p-difuran compounds (PCDD/PCDFs) during low-flow conditions were 2,880 pg/g (picograms per gram) and 5,910 pg/g in the Main Stem and West Branch, respectively, representing average annual loads of 0.14 g/yr and 2.2 g/yr, respectively. Concentrations of suspended-sediment-bound PCDD/PCDFs during high-flow conditions were 40,900 pg/g and 12,400 pg/g in the Main Stem and West Branch, respectively, representing average annual loads of 2.05 g/yr and 4.6 g/yr, respectively. Total toxic equivalency (TEQ) loads (sum of PCDD/PCDF and PCB TEQs) were 3.1 mg/yr (milligrams per year) (as 2, 3, 7, 8-TCDD) in the Main Stem and 28 mg/yr in the West Branch during low-flow conditions. Total TEQ loads (sum of PCDD/PCDFs and PCBs) were 27 mg/yr (as 2, 3, 7, 8-TCDD) in the Main Stem and 32 mg/yr in the West Branch during high-flow conditions. All of these load estimates, however, are directly related to the assumed annual discharge for the two branches. Long-term measurement of stream discharge and suspended-sediment concentrations would be needed to verify these loads. On the basis of the loads calculated from the concentrations measured in this study, it appears that the West Branch is the principal source of PCBs, PCDD/PCDFs, and total TEQ to the Elizabeth River during low-flow and high-flow conditions. Additional sources of these constituents may be present between the confluence of the two branches that make up the Elizabeth River and the head-of-tide. 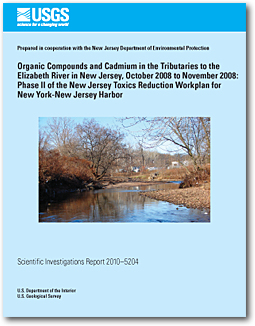 Bonin, J.L., 2010, Organic compounds and cadmium in the tributaries to the Elizabeth River in New Jersey, October 2008 to November 2008: Phase II of the New Jersey Toxics Reduction Workplan for New York–New Jersey Harbor: U.S. Geological Survey Scientific Investigations Report 2010–5204, 27 p.